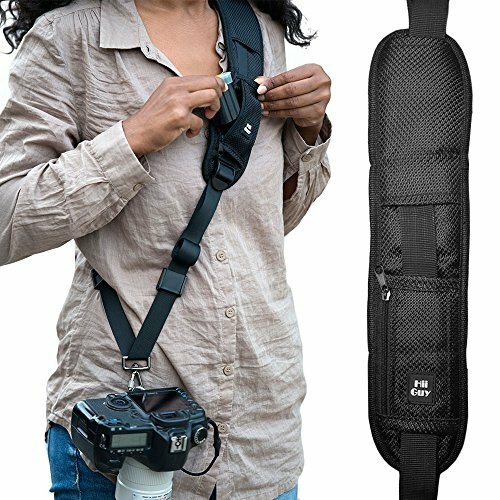 ADJUSTABLE STRAP SIZE- it’s quite strong and can support a full size SLR and zoom. You can adjust how low it hangs to your body. However, we invested a few bucks in better parts, so you can have confidence using it for a long day. Fits great for tall people as well. This strap is very comfortable, can’t feel any weight from the camera, mount plate is rubber padded on the bottom to not scratch the camera, The strap is sturdy and the mount stays secure the entire time. Much research went into the design and manufacture of this camera strap. The design we were looking for was comfort, particularly if shooting all day, safety for the camera, and flexibility to adjust to fit your body size. The Neck Screw Mount Connector is made from a high quality metal that can tighten firmly to make sure the mount stays secure the entire time. The strap includes a mini pouch for your SD card and Lens cleaning cloth so you can have these items close at hand. The quality of manufacture ensures comfort and supports the weight of the camera and lens without causing sore spots. A safety strap is included that connects to one of the rings where you would normally connect a traditional camera neck strap. Copyright © BadMonkeyPhotography. All Rights Reserved.